A MYSTERIOUS grey haired man drops a playing card in a deserted alley. Riley picks it up. The queen of hearts? He wonders if it is somehow significant. When he later hears someone refer to the Princess of Wales as the Queen of Hearts, he believes he is onto something. Before long, he is finding all kinds of bubble gum and cigarette cards on the street, each one apparently containing a further hidden clue as part of a coded message (probably from MI5). Riley makes the connections: Princess Diana is in grave and imminent danger and it’s his special mission to save her. Will Riley rise to the challenge and try to rescue the Princess, or will his obsessive pursuit of the grey haired man lead to its own tragic conclusion? 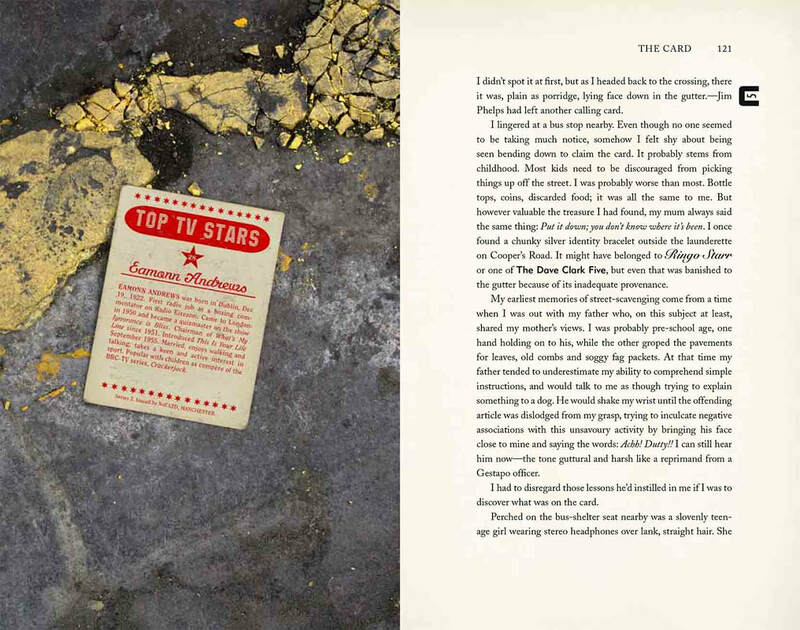 The Card is a full-length novel that contains illustrated evidence of each of the cards discovered on the secret trail. The book design and page layout highlight Riley’s natural proclivity for finding meaningful coincidences in the most unexpected places. Who else would have spotted that Barry Manilow is an anagram of Library Woman? The Card, Rawle's witty, subtle second novel, is about hidden messages…As with Woman's World, the difficulty in reviewing a novel by Rawle is that he reveals the essential information so unexpectedly, so delightfully, with such a deft and humorous voice, that it's a shame to give anything away and spoil the surprises. Rawle balances the comedy and pathos with precision…The Card is as emotionally affecting as it is intellectually nimble…Rawle’s designs for the cards that Riley finds are, as one would expect from an illustrator of his calibre, little joys in their own right. To be in Riley’s mind, a place where the fact that Barry Manilow is an anagram of Library Woman is meaningful, is a strange privilege. The world may be arbitrary, contingent and ungraspable, but The Card insists that the ability to turn it into a story is a minor miracle. Rawle is so very good at enabling us to see the world from Riley’s pattern-spotting perspective. The result is that Riley’s crackpot logic feels perfectly logical, even though we know his perceptions are off-kilter and untrustworthy…There are so many reasons to love Rawle and all he produces, but for his deployment of imagery alone, he deserves to be treasured… I shall be happily pondering all the subtle mysteries of The Card for weeks to come. What a virtuoso performance! What a treasure we have in Graham Rawle. The Card by Graham Rawle is engaging, thought-provoking, and at times laugh out loud funny. The use of typographical features to highlight parts of the text and Rawle's illustrations of the cards is also visually striking. This story about ephemera is in no way short-lived. Liz Ellis, Manchester Evening News. [A] jolly but surprisingly moving account of an overactive mind troubled by boyhood heartache…Rawle’s charming illustrations aptly make this pun-packed trawl through pop-cultural history a collector’s item itself. …The sort of paranoia-driven escapade that Alfred Hitchcock would be proud of. The many sides of this fiercely creative puzzler somehow come together as something absurdly charming.